^ Leishmaniasis: Magnitude of the problem. World Health Organization. ^ Visceral leishmaniasis. Institute for OneWorld Health. ^ World Health Organization action in Afghanistan aims to control debilitating leishmaniasis. ^ A Small Charity Takes the Reins in Fighting a Neglected Disease, New York Times, July 31, 2006. During his two-and-a-half-year walk through the Amazon, Ed Stafford tested positive for cutaneous leishmaniasis in Oriximiná, Para, Brazil. He convinced the local doctor that he could not stay in one place for treatment due to his undertaking, and was prescribed with 20 days of intravenous injections that he self-administered in the jungle. While filming the latest series of Extreme Dreams in Peru, UK television presenter Ben Fogle caught the disease. He was left bedridden for three weeks on his return home. Fogle was treated at London's Hospital for Tropical Diseases. Magazine photographer Joel Sartore was diagnosed with the disease after a skin lesion refused to heal following a photo shoot in the Bolivian wilderness. Following intensive IV treatment similar to chemotherapy, his infection has resolved. Since September 2011, a World Community Grid project called Drug Search for Leishmaniasis has the goal to find new drugs against this disease. HIV protease inhibitors have been found to be active against Leishmania species in two in vitro studies in Canada and India. The studies reported the intracellular growth of parasites was controlled by nelfinavir and ritonavir in a human monocyte cell line and also in human primary monocyte-derived macrophages. In 2009, the Hebrew University of Jerusalem Kuvin Center for the Study of Infectious and Tropical Diseases, in a collaborative effort with Addis Ababa University, was awarded a grant by the Bill & Melinda Gates Foundation for research into visceral leishmaniasis in Ethiopia. The project will gather data to be analyzed to identify the weak links in the transmission cycle, and devise methods for control of the disease. In February 2012, the nonprofit Infectious Disease Research Institute launched the world’s first human clinical trial of the visceral leishmaniasis vaccine, a recombinant form of two fused Leishmania parasite proteins with an adjuvant. Two phase-1 clinical trials with healthy volunteers are to be conducted. The first one takes place in Washington and is followed by a trial in India. Several potential Federal Institute of Technology (ETH) in Zürich are trying to design a carbohydrate-based vaccine. The genome of the parasite L. major has been sequenced, possibly allowing for identification of proteins that are used by the pathogen but not by humans; these proteins are potential targets for drug treatments. The World Health Organization has gotten a reduced cost for liposomal amphotericin B at $18 a vial, but many vials may be needed for treatment and it must be kept cool. The Institute for OneWorld Health has reintroduced the drug paromomycin for treatment of leishmaniasis, results with which led to its approval as an orphan drug. The Drugs for Neglected Diseases Initiative is also actively facilitating the search for novel therapeutics. A treatment with paromomycin will cost about $10. The drug had originally been identified in 1960s, but had been abandoned because it would not be profitable, as the disease mostly affects poor people. The Indian government approved paromomycin for sale in August 2006. It remains unclear who first discovered the organism. spleen of a patient who had died from "dum-dum fever" (Dum Dum is an area close to Calcutta) and proposed them to be trypanosomes, found for the first time in India. A few months later, Captain Charles Donovan (1863–1951) confirmed the finding of what became known as Leishman-Donovan bodies in smears taken from people in Madras in southern India. But it was Ronald Ross who proposed that Leishman-Donovan bodies were the intracellular stages of a new parasite, which he named Leishmania donovani. The link with the disease kala-azar was first suggested by Charles Donovan, and was conclusively demonstrated by Charles Bentley's discovery of L. donovani in patients with kala-azar. The disease became a major problem for Allied troops fighting in Sicily during the Second World War; research by Leonard Goodwin then showed pentostam was an effective treatment. Descriptions of conspicuous lesions similar to cutaneous leishmaniasis appear on tablets from King Ashurbanipal from the seventh century BCE, some of which may have derived from even earlier texts from 1500 to 2500 BCE. Persian physicians, including Avicenna in the 10th century CE, gave detailed descriptions of what was called balkh sore. In 1756, Alexander Russell, after examining a Turkish patient, gave one of the most detailed clinical descriptions of the disease. Physicians in the Indian subcontinent would describe it as kala-azar (pronounced kālā āzār, the Urdu, Hindi, and Hindustani phrase for "black fever", kālā meaning black and āzār meaning fever or disease). In the Americas, evidence of the cutaneous form of the disease in Ecuador and Peru appears in pre-Inca pottery depicting skin lesions and deformed faces dating back to the first century CE. Some 15th- and 16th-century texts from the Inca period and from Spanish colonials mention "valley sickness", "Andean sickness", or "white leprosy", which are likely to be the cutaneous form. Leishmaniasis is mostly a disease of the developing world, and is rarely known in the developed world outside a small number of cases, mostly in instances where troops are stationed away from their home countries. 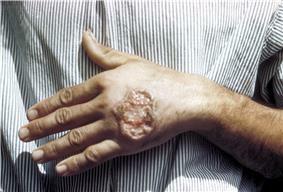 Leishmaniasis has been reported by U.S. troops stationed in Saudi Arabia and Iraq since the Gulf War of 1990, including visceral leishmaniasis. In September 2005, the disease was contracted by at least four Dutch marines who were stationed in Mazari Sharif, Afghanistan, and subsequently repatriated for treatment. The disease is found across much of Asia, and in the Middle East. Within Afghanistan, leishmaniasis occurs commonly in Kabul, partly due to bad sanitation and waste left uncollected in streets, allowing parasite-spreading sand flies an environment they find favorable. In Kabul, the number of people infected was estimated to be at least 200,000, and in three other towns (Herat, Kandahar, and Mazar-i-Sharif) about 70,000 more occurred, according to WHO figures from 2002. Kabul is estimated as the largest center of cutaneous leishmaniasis in the world, with around 67,500 cases as of 2004. Africa, in particular the East and North, is also home to cases of leishmaniasis. Leishmaniasis is found through much of the Americas from northern Argentina to South Texas, though not in Uruguay or Chile, and has recently been shown to be spreading to North Texas. Leishmaniasis is also known as papalomoyo, papa lo moyo, ulcero de los chicleros, and chiclera in Latin America. During 2004, an estimated 3,400 troops from the Colombian army, operating in the jungles near the south of the country (in particular around the Meta and Guaviare departments), were infected with leishmaniasis. Allegedly, a contributing factor was that many of the affected soldiers did not use the officially provided insect repellent because of its disturbing odor. Nearly 13,000 cases of the disease were recorded in all of Colombia throughout 2004, and about 360 new instances of the disease among soldiers had been reported in February 2005. Leishmaniasis occurs in 88 tropical and subtropical countries. About 350 million people live in these areas. The settings in which leishmaniasis is found range from rainforests in Central and South America to deserts in western Asia and the Middle East. It affects as many as 12 million people worldwide, with 1.5–2.0 million new cases each year. The visceral form of leishmaniasis has an estimated incidence of 500,000 new cases. More than 90% of the world's cases of visceral leishmaniasis are in India, Bangladesh, Nepal, Sudan, and Brazil. As of 2010, it caused about 52,000 deaths, down from 87,000 in 1990. Different types of the disease occur in different regions of the world. Cutaneous disease is most common in Afghanistan, Algeria, Brazil, Colombia, and Iran, while mucocutaneous disease is most common in Bolivia, Brazil, and Peru, and visceral disease is most common in Bangladesh, Brazil, Ethiopia, India, and Sudan. Disability-adjusted life year for leishmaniasis per 100,000 inhabitants. The treatment is determined by where the disease is acquired, the species of Leishmania, and the type of infection. For visceral leishmaniasis in India, South America, and the Mediterranean, liposomal amphotericin B is the recommended treatment and is often used as a single dose. Rates of cure with a single dose of amphotericin have been reported as 95%. In India, almost all infections are resistant to pentavalent antimonials. In Africa, a combination of pentavalent antimonials and paromomycin is recommended. These, however, can have significant side effects. Miltefosine, an oral medication, is effective against both visceral and cutaneous leishmaniasis. Side effects are generally mild, though it can cause birth defects if taken within 3 months of getting pregnant. It does not appear to work for L. major or L. braziliensis. The evidence around the treatment of cutaneous leishmaniasis is poor. A number of topical treatments may be used for cutaneous leishmaniasis. Which treatments are effective depends on the strain, with topical paromomycin effective for L. major, L. tropica, L. mexicana, L. panamensis, and L. braziliensis. Pentamidine is effective for L. guyanensis. Oral fluconazole or itraconazole appears effective in L. major and L. tropica. Most forms of the disease are transmitted only from nonhuman animals, but some can be spread between humans. Infections in humans are caused by about 21 of 30 species that infect mammals; the different species look the same, but they can be differentiated by isoenzyme analysis, DNA sequence analysis, or monoclonal antibodies. Several different polymerase chain reaction tests are available for the detection of Leishmania DNA. With this assay, a specific and sensitive diagnostic procedure is finally possible. Leishmaniasis is diagnosed in the hematology laboratory by direct visualization of the amastigotes (Leishman-Donovan bodies). Buffy-coat preparations of peripheral blood or aspirates from marrow, spleen, lymph nodes, or skin lesions should be spread on a slide to make a thin smear and stained with Leishman stain or Giemsa stain (pH 7.2) for 20 minutes. Amastigotes are seen within monocytes or, less commonly in neutrophils, of peripheral blood and in macrophages of aspirates. They are small, round bodies 2–4 μm in diameter with indistinct cytoplasm, a nucleus, and a small, rod-shaped kinetoplast. Occasionally, amastigotes may be seen lying free between cells. However, the retrieval of tissue samples is often painful for the patient and identification of the infected cells can be difficult. So, other indirect immunological methods of diagnosis are developed, including enzyme-linked immunosorbent assay, antigen-coated dipsticks, and direct agglutination test. Although these tests are readily available, they are not the standard diagnostic tests due to their insufficient sensitivity and specificity. Visceral disease is usually caused by Leishmania donovani, L. infantum, or L. chagasi, but occasionally these species may cause other forms of disease. The cutaneous form of the disease is caused by more than 15 species of Leishmania. Although most of the literature mentions only one genus transmitting Leishmania to humans (Lutzomyia) in the New World, a 2003 study by Galati suggested a new classification for New World sand flies, elevating several subgenera to the genus level. Elsewhere in the world, the genus Phlebotomus is considered the vector of leishmaniasis. The polycistronic units in a head-to-head or tail-to-tail manner; RNA polymerase II transcribes long polycistronic messages in the absence of defined RNA pol II promoters, and Leishmania has unique features with respect to the regulation of gene expression in response to changes in the environment. The new knowledge from these studies may help identify new targets for urgently needed drugs and aid the development of vaccines. 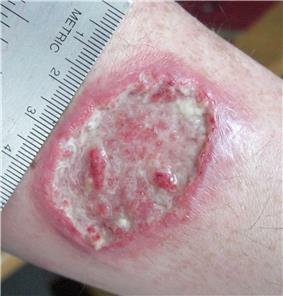 Leishmaniasis is transmitted by the bite of infected female phlebotomine sandflies which can transmit the infection Leishmania. The sandflies inject the infective stage, metacyclic promastigotes, during blood meals (1). Metacyclic promastigotes that reach the puncture wound are phagocytized by macrophages (2) and transform into amastigotes (3). Amastigotes multiply in infected cells and affect different tissues, depending in part on which Leishmania species is involved (4). These differing tissue specificities cause the differing clinical manifestations of the various forms of leishmaniasis. Sandflies become infected during blood meals on infected hosts when they ingest macrophages infected with amastigotes (5,6). In the sandfly's midgut, the parasites differentiate into promastigotes (7), which multiply, differentiate into metacyclic promastigotes, and migrate to the proboscis (8). Visceral leishmaniasis or kala-azar ('black fever') is the most serious form, and is potentially fatal if untreated. Other consequences, which can occur a few months to years after infection, include fever, damage to the spleen and liver, and anemia.